You may not be eligible for this product or for the bonus. Click here opens overlay to see specific eligibility conditions. Already have a Marriott Bonvoy Boundless™ credit card? Get 20,000 bonus points for each friend who gets the Marriott Bonvoy Boundless™ credit card. Marriott Bonvoy Boundless™ credit card? ** These benefits are available when you use your card. Restrictions, limitations and exclusions apply. Most benefits are underwritten by unaffiliated insurance companies who are solely responsible for the administration and claims. There are specific time limits and documentation requirements. Once your account is opened we will send you a Guide to Benefits, which includes a full explanation of coverages. Marriott Bonvoy™ is not responsible for the benefits described in the Guide to Benefits. If you are an existing Marriott Rewards Premier or Marriott Bonvoy™ Premier customer and would like this product, please call the number on the back of your card to see if you are eligible for an upgrade bonus. New cardmember bonus: To qualify and receive your bonus, you must make Purchases totaling $5,000 or more during the first 3 months from account opening. ("Purchases" do not include balance transfers, cash advances, travelers checks, foreign currency, money orders, wire transfers or similar cash-like transactions, lottery tickets, casino gaming chips, race track wagers or similar betting transactions, any checks that access your account, interest, unauthorized or fraudulent charges, and fees of any kind, including an annual fee, if applicable.) After qualifying, please allow up to 8 weeks for bonus points to post to your Marriott Bonvoy™ account. To be eligible for this bonus offer, account must be open and not in default at the time of fulfillment. If your account is not open for at least 6 months, Marriott and Chase reserve the right to deduct the bonus points from your Marriott Bonvoy™ account. Rewards Program Agreement: For more information about the Marriott Bonvoy Boundless™ card rewards program, view the latest Rewards Program Agreement. We will mail your Rewards Program Agreement once your card account is established. If you become a Chase Online customer, your Rewards Program Agreement will also be available after logging in to chase.com. How you can earn points: You'll earn points when you, or an authorized user, use a Marriott Bonvoy™ credit card to make purchases of products and services, minus returns or refunds. Buying products and services with your card, in most cases, will count as a purchase; however, the following types of transactions won't count and won't earn points: balance transfers, cash advances and other cash-like transactions, lottery tickets, casino gaming chips, race track wagers or similar betting transactions, any checks that access your account, interest, unauthorized or fraudulent charges, and fees of any kind, including an annual fee, if applicable. 6 points ("6X points"): You'll earn 6 points for each $1 spent on qualifying purchases made at participating Marriott Bonvoy™locations. Go to marriottbonvoy.com/about for a list of participating Marriott Bonvoy locations. You will only receive the accelerated earn of 6 points for each $1 spent from the credit card program. Additional points received under the Marriott Bonvoy program for stays at participating Marriott Bonvoy locations will be earned in accordance with the terms and conditions of the Marriott Bonvoy programs. 2 points ("2X points"): You'll earn 2 points for each $1 spent on all other purchases. Information about earning/transferring points to Marriott Bonvoy: Points earned during a billing cycle will be automatically transferred to Marriott Bonvoy after the end of each billing cycle. Points expiration: The points transferred to your Marriott Bonvoy account won't expire as long as there is card earning activity or other qualifying earning or redemption activity every 24 months. If your card account is closed, you'll lose the points in your Marriott Bonvoy account if you don't have any other qualifying earning or redemption activity every 24 months. For details on this points expiration policy, visit marriottbonvoy.com/terms. Losing points: You'll immediately lose all points that haven't been transferred to Marriott Bonvoy if your card account status changes, or your card account is closed for program misuse, fraudulent activities, failure to pay, bankruptcy, or other reasons described in the terms of the Rewards Program Agreement. All Marriott Bonvoy terms and conditions apply, available at marriottbonvoy.com/terms. Your points will not expire as long as you remain an active member in the Marriott Bonvoy™ Program. You remain active by doing one or more of the following during any 24-month period: (a) have an eligible stay at a participating property; (b) earn Marriott Bonvoy Points by using a Marriott Bonvoy Visa Credit Card for purchases (note that paying the credit card annual membership fee is not considered purchase activity); or (c) otherwise earn Marriott Bonvoy Points or miles in accordance with the Marriott Bonvoy Program terms and conditions. Purchases are when you, or an authorized user, use the card to make purchases of products and services, minus returns or refunds. Buying products and services with your card, in most cases, will count as a purchase; however, the following types of transactions won't count and won't earn points: balance transfers, cash advances, travelers checks, foreign currency, money orders, wire transfers or similar cash-like transactions, lottery tickets, casino gaming chips, race track wagers or similar betting transactions, any checks that access your account, interest, unauthorized or fraudulent charges, and fees of any kind, including an annual fee, if applicable. If you do not remain an active member, then Marriott Bonvoy reserves the right, in its sole discretion, to close your Marriott Bonvoy account without notice to you. In the event your Marriott Bonvoy account is closed, all unredeemed points in your Marriott Bonvoy account will be forfeited. Please allow up to 8 weeks from your account anniversary date for your Anniversary Free Night Award E-Certificate to be automatically deposited in to your Marriott Bonvoy™ Account. Account anniversary date is the date that is twelve months after your account open date, and the same date each twelve months thereafter. Your Anniversary Free Night Award is valid for a one night hotel stay at a property with a redemption level up to 35,000 points. For the list of participating hotels where you can redeem the 35,000 points, log on to redeem.marriottbonvoy.com/hotels or call the Marriott Bonvoy number on the back of your card. Your e-certificate may not be combined with cash or other Marriott Bonvoy points when redeeming for your free night, and may not be transferred, extended beyond expiration date, or re-credited for points. Each Anniversary Free Night Award issued will have an expiration of 12 months. To qualify for the Anniversary Free Night Award, your account must be open and not in default on your account anniversary date. Offer and Anniversary Free Night rules and regulations are subject to change. Chase is not responsible for offer fulfillment. Annual fee applies. For pricing details, please see Pricing & Terms. The number of Marriott Bonvoy™ points needed for a standard Free Night Award starts at 7,500 points. Refer to marriottbonvoy.com/about for all reward redemption values. Upon opening your Card Account, a maximum of 15 Elite Night credits will be credited to your Marriott Bonvoy™ member account within 60 days. On or before March 1 of each subsequent calendar year, a maximum of 15 Elite Night credits will be credited to your Marriott Bonvoy member account operated by Marriott International, Inc. in accordance with Marriott Bonvoy terms and conditions. To be eligible to receive the 15 Elite Night credits with this Card, you must be the primary cardmember, your Card Account must be open as of December 31 of the prior year, and you must have an active Marriott Bonvoy member account linked to your credit card account. This benefit is not exclusive to credit cards offered by Chase. A maximum of 15 Elite Night credits will be awarded per Marriott Bonvoy program member account even if the member has more than one Credit Card linked to their Marriott Bonvoy account. When your Marriott Bonvoy member accounts are merged, if both accounts have received 15 Elite Night credits, only one 15 Elite Night Credit will remain. Chase is not responsible for offer fulfillment or the provision of or failure to provide the stated benefits and services. You will automatically receive Silver Elite Status each account anniversary year as a cardmember ("Account anniversary year" means the year beginning with account open date through the anniversary of your account open date, and each 12 months after that). Please allow up to 8 weeks from account open date for your initial Silver Elite Status award to be applied to your Marriott Bonvoy™ account. To qualify for and maintain Silver Elite Status your account must be open and not in default. If you do not qualify for Silver Elite status as a cardmember, in order to receive Silver Elite benefits you must qualify for Silver Elite Status under the terms of the Marriott Bonvoy program. Only one Marriott Bonvoy Credit Card account per Marriott Bonvoy member (Marriott Bonvoy member must be the primary cardmember on that account), is eligible for the Silver Elite Status award. Chase Bank USA, N.A. is not responsible for offer fulfillment or the provision of or failure to provide the Silver Elite benefits and services. Each Account Anniversary Year you make purchases totaling $35,000 or more you will qualify for Gold Elite Status through December 31 of the following year. ("Account Anniversary Year" means the year beginning with your account open date through the first statement after the anniversary of your account open date, and each twelve billing cycles thereafter.) Purchases are when you, or an authorized user, use the card to make purchases of products and services, minus returns or refunds. Buying products and services with your card, in most cases, will count as a purchase; however, the following types of transactions won't count and won't earn points: balance transfers, cash advances, travelers checks, foreign currency, money orders, wire transfers or similar cash-like transactions, lottery tickets, casino gaming chips, race track wagers or similar betting transactions, any checks that access your account, interest, unauthorized or fraudulent charges, and fees of any kind, including an annual fee, if applicable. Please allow up to 8 weeks after qualifying for the Gold Elite Status award to be applied to your Marriott Bonvoy™ account. To qualify for and maintain Gold Elite Status your account must be open and not in default. If you do not qualify for this bonus offer, in order to receive Gold Elite benefits you must qualify for Gold Elite Status under the terms of the Marriott Bonvoy program. Only one Marriott Bonvoy Boundless™ Credit Card account per Marriott Bonvoy member (Marriott Bonvoy member must be the primary cardmember on that account) is eligible for the Gold Elite Status award. Chase Bank USA, N.A. is not responsible for offer fulfillment or the provision of or failure to provide the Gold Elite benefits and services. Marriott Bonvoy™ Credit Cards are available to US residents that have a valid permanent home address within the 50 United States or the District of Columbia only. You agree that when you apply for a Marriott Bonvoy™ credit card and for as long as you maintain an open account, your relationship with Chase Bank USA, N.A. or other credit card issuers of Marriott International, Inc. may be disclosed to other Marriott Bonvoy credit card issuers. Points accrued and awards issued are subject to the terms and conditions of the Marriott Bonvoy™ program. Click here, marriottbonvoy.com/terms, for complete terms and conditions of the Marriott Bonvoy program, including all redemption values, or refer to marriottbonvoy.com/about. Terms and conditions of the Marriott Bonvoy program may be modified and services and benefits may be added or deleted at any time without notice to Cardmembers. 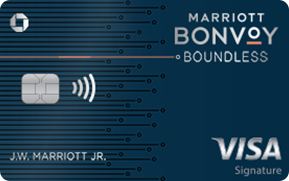 Individuals whose request for a credit card are not approved will not be enrolled in the Marriott Bonvoy program through this offer, although existing Marriott Bonvoy memberships will not be affected. Additional authorized users will not be enrolled in the Marriott Bonvoy program as a result of this offer. Marriott Bonvoy points awarded through the use of the authorized user's card will only be credited to the Primary Cardmember's Marriott Bonvoy account. Accounts subject to credit approval. Restrictions and limitations apply. Marriott Bonvoy™ credit cards are issued by Chase Bank USA, N.A. Offer subject to change. Begin Affirmation Thank You overlay. Begin Affirmation Thank You content. End Affirmation Thank You content.